If you want to conjure up fabulous arrangements for your home, you have to aim high. Very high. Look up and search for inspirations among the stars. That's where you can find the true magic that will provide you with amazing decorative ideas. With just a few clever tricks you'll discover that a fast and spectacular interior metamorphosis is within your reach. What kind of tricks? Here's a handful of ideas! 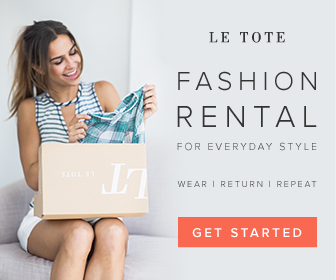 What do you do when you want to add some original character to your little black dress? You choose expressive accessories to make the classic design appear more fresh or even extravagant. Ultimately, it's the accessories that make or break the outfit. The world of interior design is governed by the exact same rule. You can change your conventional, unimpressive interior by 180 degrees using just a few extraordinary accessories. What design is best for the purpose? Cosmic patterns, revolving galaxies, and hypnotic black holes! If you wish to embark on a journey to the faraway corners of the universe, sit comfortably and join me on a cosmic path that experts from Myloview marked for us. For many people, the living room is the most crucial space in a house. It is therefore important to make sure that the heart of your home looks as good as possible. The fastest way to achieve a complete metamorphosis is using a mural. However, the design of the mural has to really be unique, which is why extraterrestrial sights seem to be a perfect choice. Despite the common belief, these types of images don't necessarily have to be dark and won't overshadow the rest of the arrangement. After all, the universe over our heads is full of colorful phenomena, like the breathtaking rainbow nebulas, which have the power to forever transform a regular room if you let them inside. And if you really enjoy brave and original concepts, go one step further than just decorating walls. 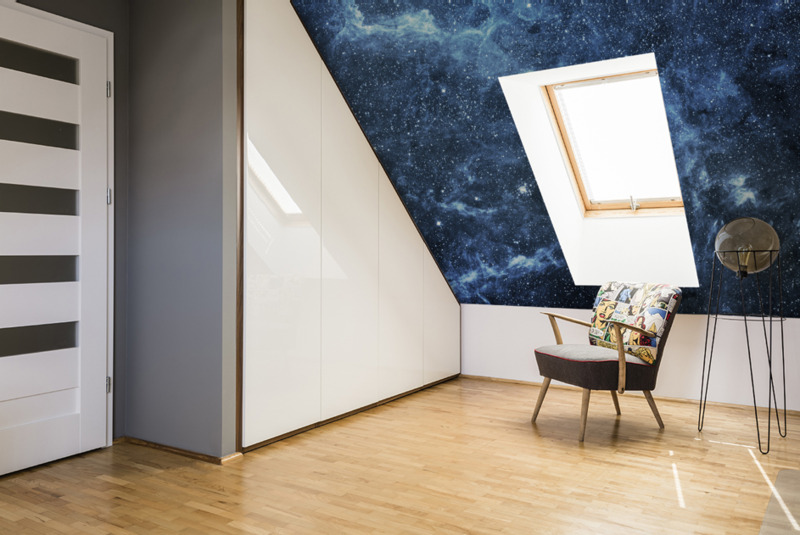 The self-adhesive galaxy sticker for ceiling can put an astonishing view right over your head. This solution is perfect for apartments with slanted walls, which make it difficult to hang regular paintings or posters. Which other interior is also ideally suited for space-inspired decorative elements? The bedroom, of course. In this case, consider using different types of textiles to make the interior more attractive, but also cozier and pleasant to look at. What should we do to achieve this effect? Some spectacular ideas include navy blue, starry bedding, or decorative cushions with revolving, purple galaxies, which you can put on your bed. But that's just the beginning. You can also hang a fashionable, typographic poster on your wall, with a night sky background and a motivational quote. 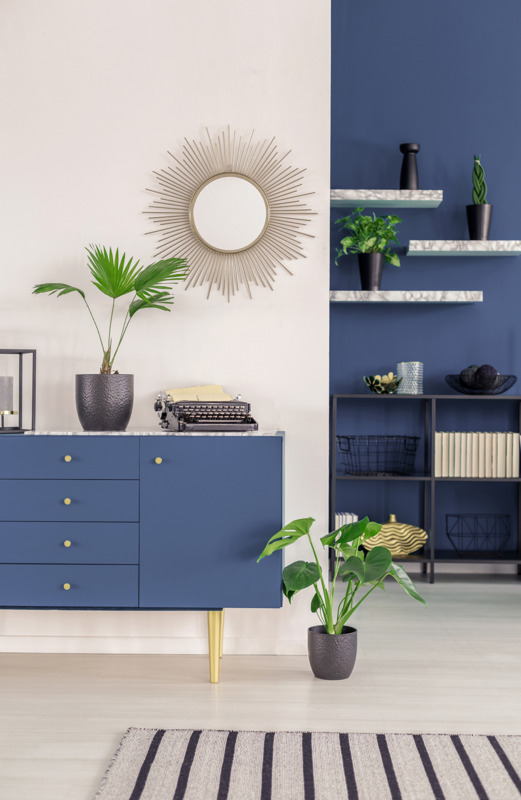 And for those of you who have a bit more time to decorate the room, we recommend sparkling paint with tiny flecks of glitter, which you can use to paint a wall or the ceiling. We live in a time where nothing is ever repaired or modified. Whenever something gets boring or goes out of fashion, we throw it away. This habit is very non-ecological and results in producing massive amounts of waste. So, if you feel like it's time to change the furniture in your living room, kitchen, or hallway, use the easily-applicable galaxy sticker. Adding a cosmic pattern to your old cabinet will completely transform the familiar object and bring a whole new quality to the interior. It's also a great way to hide any scratches or discoloration that you can't get rid of. But there are even more applications of such a decoration. What kind? You can use a galaxy sticker to beautify your laptop case. This will make your work or watching movies significantly more pleasurable. You can also decorate your fridge, if up until this point it used to be just a white chunk of metal standing out among the rest of the furniture. If you're inspired by cosmic esthetics, you need to incorporate some shiny silver accessories in your arrangements. They certainly highlight the unearthly character of the décor. Internet stores offer hundreds of incredible designs, and the only limiting factor is your own imagination. You can achieve a fantastic effect by using silver poufs, which make the living room more appealing and are very useful whenever friends drop by. Another important decorative element is the lighting. 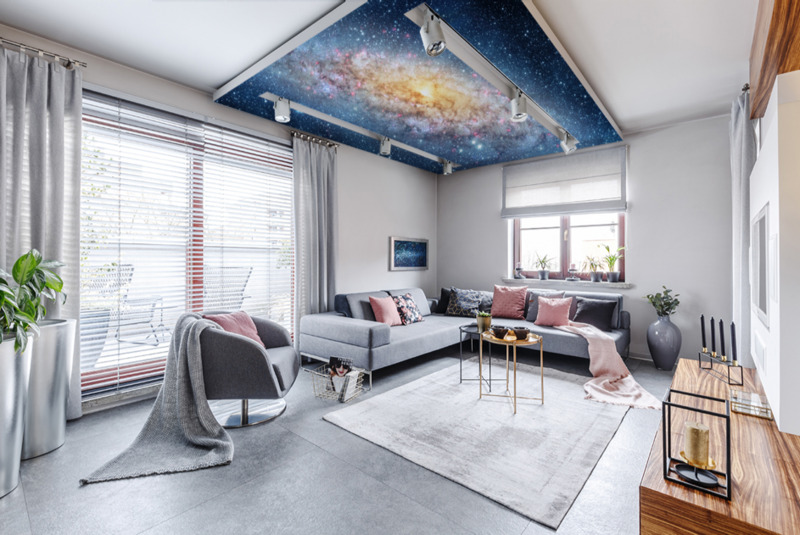 Shining LED ring lamps are a perfect way to complement a revolving galaxy mural in the living room. For the bedroom, we recommend a practical mirror, shaped like a multi-pointed star. You can even enhance the effect if you hang it so that it reflects the sun or lamplight. The world of interior design knows no boundaries. If you want, you can fit the entire universe in your living room, and wake up to the sight of vibrant nebulas in your bedroom. Look at the dozens of interesting ideas and choose those most suitable for your home. Add a few unique accessories and enjoy a whole new interior design.